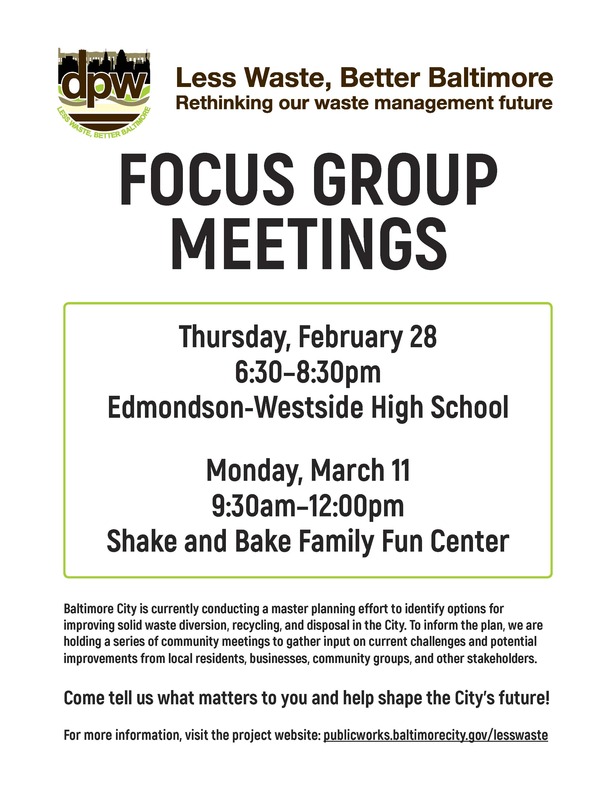 The “Less Waste, Better Baltimore” Recycling and Solid Waste Management Master Plan process is moving into the community, with two public meetings scheduled for the coming weeks. We are holding a series of community meetings to gather input on current waste disposal challenges and potential improvements from local residents, businesses, community groups, and other stakeholders. Come tell us what matters to you and help shape the City’s future! The first meeting is 6:30 p.m. to 8:30 p.m. Thursday, Feb. 28, at Edmonson-Westside High School, 501 N. Athol Avenue. The second is 9:30 a.m. to 12 p.m. Monday, March 11, at the Shake and Bake Family Fun Center, 1601 Pennsylvania Avenue. Residents who cannot attend a meeting may still weigh in by taking the survey on the DPW website. Visit http://publicworks.baltimorecity.gov/lesswaste, or email [email protected] with specific questions or concerns.